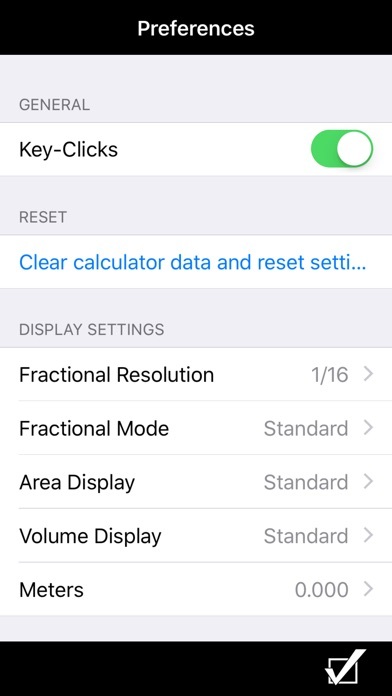 Building Materials Estimating Calculator by Calculated Industries And while perhaps obvious, if you change from an iOS device to a non-iOS device, you WILL need to buy a new license as they are incompatible. The Material Estimator Building Materials Estimating app from Calculated Industries will help you save time and money on any building project. Quickly and easily calculate material quantities, costs and allowances. 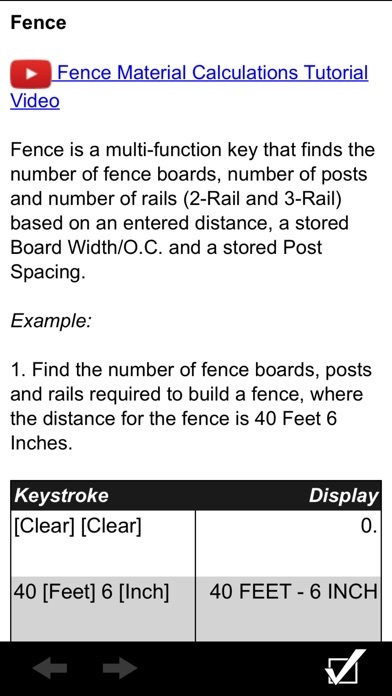 Work in and convert between feet, inches, fractions, yards and metric -- and includes a full User’s Guide built in as well as the ability to press and hold a key for specific help! How much? How many? Quickly estimate cost and quantity – get EXACTLY what you need. • Answers the questions you ask on the job every day: How many do I need? How much will it cost? • Built-in answers for materials and spacing • Get exactly what you need with built-in function keys and cost and percent functions • Save time and money by eliminating estimating errors • Convert between all standard building math dimensions Ideal for contractors, trades people and estimating professionals who need to estimate materials and costs for concrete, fences, decks, bricks, tile, flooring, gravel, painting, drywall and paneling and more. 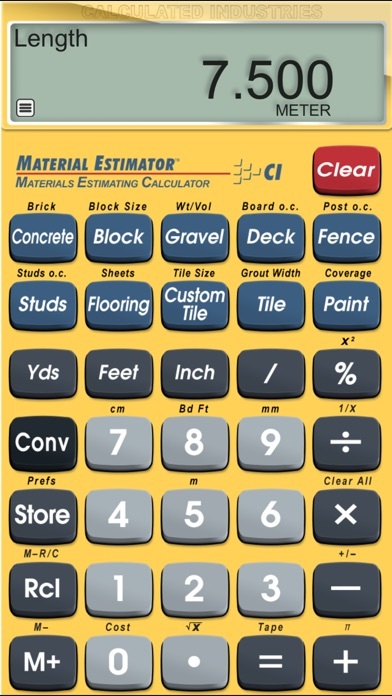 Built-in functions help you find instant solutions for: ● Tile, Custom Tiles, Flooring, Drywall and Paneling ● Decks, Fencing, Studs and On-center Spacing ● Concrete, Blocks and Bricks ● Paint ● Gravel Created by Calculated Industries, the originator of the award-winning Construction Master® calculators. FEATURES: ● Easily calculate material costs and allowances using cost and percent (%) functions. ● Store coverage areas and spacing to instantly get accurate material estimates for your jobs and projects. ● Full dimensional calculator for all your linear, square area or cubic volume calculation needs. Time-saving Utilities Include ● Works directly in Feet, Inches, Fractions, Yards and Meters – including square and cubic formats. No need to convert to decimals. ● Quickly and accurately find material requirements for Studs, 4x8, 4x9, 4x10, 4x12 Sheets, Board Feet, Floor Tiles, Blocks, Bricks, Gravel, and Paint. ● Board Feet and Cost per Unit functions estimate material costs instantly. Special Functions ● Entry Editing Backspace Key – with a swipe of a finger ● Cost per Unit: Solve unit cost and pricing ● Paperless Tape ● Memory Function ● User-Definable Preferences — set custom options: Fractions, Area, Volume. TRADEMARKS: Construction Master® is a registered trademark of Calculated Industries, Inc. I loved the older look of the app instead of the fake look we have now. The app works great and I highly recommend it to everyone. 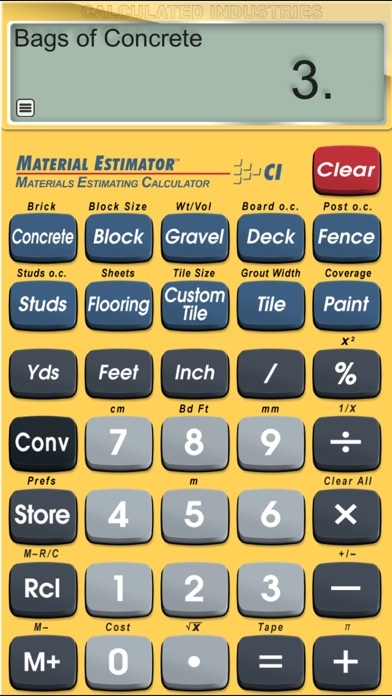 Much cheaper than the calculator but I use it everyday at work for flooring. 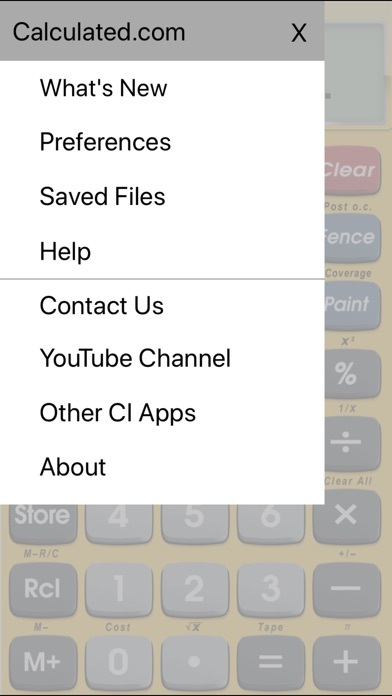 I got this app to replace my material estimator calculator, I keep breaking. I use this calculator every day, ordering stone, concrete, even paint. It also converts mm to inches. It makes all these ordering situations easy, plus its about a third the price of the actual calculator and since it's on your phone it's always with you! I highly recommend this app! I was so upset when I lost my first one and could not find one in the stores where I live. If you do handyman work own a house rent whatever project you need help with this calculator does it for you. You can't afford to not have it in the tool box. The best part for me is I won't lose it because I always have my phone with me. I had a calc. that I used for years that did all of these formulas. Now I have it on my phone. Its easy and very useful. hey guys you have a great product. however lets get up to date and enhance the icon and app graphics. thanks! !